← Cairns – We will be back! My story starts with my husband and I taking our first adventure by walking the Milford Track in New Zealands’ South island where we met a very special young Japanese girl who was on her own adventure having left Japan for New Zealand without speaking a word of English. By the time we met her on the track she was quite good with her English and we established a very good friendship. Before leaving for home, we invited her to come and visit with us if she managed to travel to Australia. How excited we were a few months later to receive a phone call to say she was in Sydney and about to board the train to our home town of Taree in NSW. We met her at the station and had the pleasure of her company and were told her detailed life history while she stayed with us for 6 weeks. As her Mum had died when she was only nine, she adopted me as her Ozzie mum and we grew very close. After returning to Japan, she met a lovely young man, and when they decided to marry, they invited us to be part of the wedding party. Unfortunately we were already booked on the cruise of a lifetime to Alaska through our wonderful membership in WorldMark, and so a photo of us was placed on the wedding table and we were introduced to the guests as Mum and Dad from Ozzie. We were very honoured to have been accepted by the whole family as part of the celebration. We wanted to do something special for this lovely young couple and after they had their first child we started organising for them to come to Australia so we could meet the husband and the child and show them how cherished they had all become to us. 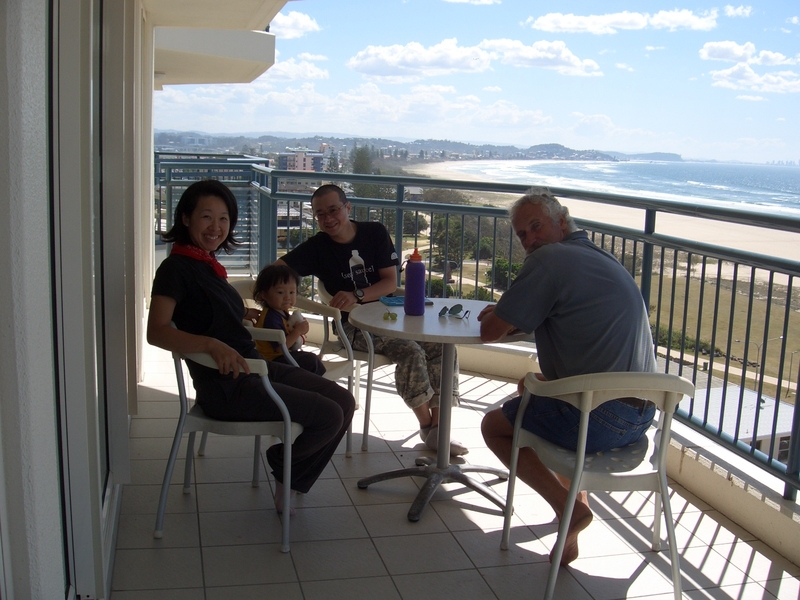 We arranged a week at the wonderful WorldMark Resort at Kirra Beach on the Gold Coast, and when we met them at the airport it was just as exciting for us as it was for them. They had even taught the son to speak our names in English. They had never stayed in a hotel, let alone a beautiful apartment and when we told them they had the main bedroom they could not believe how beautiful it was. The view of the ocean from the balcony was amazing for them and something they will remember for ever. Their young son had never seen the sea and watching him on the sand was a delight. We took them sightseeing all up into the Hinterlands and of course to the Gold Coast Strip, and even had the opportunity to manage for him to skydive and land right on the beach in front of the resort. The magic we were able to share with them courtesy of our WorldMark Membership is something we will always be grateful for and the memories will stay with us forever. We will try to arrange another week with them in Tokyo in another beautiful WorldMark Resort in the near future. Thanks to our WorldMark membership we have been able to utilise accommodation in Cairns, and Coffs Harbour in Australia and Vancouver, Victoria and Whistler in Canada and Seattle in USA. The units over there were just as beautiful as we expect to find here in Australia. Why would you not be a WorldMark Member? This entry was posted in (QLD) Gold Coast, International and tagged friendship, gold coast, holiday, Kirra Beach, travel, USA, vacation ownership, worldmark, Wyndham Resorts. Bookmark the permalink.